In a post apocalyptic future, one man travels West carrying a sacred book. When the traveler comes across a small town of survivors who seek what he is carrying, he must fight his way through the town and its leader in order to keep the book protected and complete his path. When it comes to post apocalyptic stories I am already sold. Like other cinephiles who crave for zombie or vampire movies, I absolutely love the themes that can be attributed to the apocalypse genre of film. In theory, the apocalypse genre can take a stark look into the survival habits and humanity of mankind in its most stripped down form. Here in "The Book of Eli" the Hughes brothers try to deliver a poignant tale of one man's hope that faith and humanity can be restored in a post apocalyptic world. Sadly the film doesn't accomplish what it set out do. Instead the action drama stretches the material in ways that lead the viewer to question the end result too many times over. "The Book of Eli" does work tremendously on a few levels. Namely the cinematography and score. Absolutely outstanding. Atticus Ross, who has worked with Trent Reznor in the band Nine Inch Nails, scored "The Book of Eli" and does a masterful job in playing to the storyline (including its twists) of the Hughes brothers film. Ross also creates flawless tension and panic throughout the film that helps to draw the viewer into a story that overall felt very stop and go. I was thoroughly riveted by all the visuals filmed by cinematographer Don Burgess. The New Mexico landscape once again provided a daunting backdrop to the apocalyptic tale penned by Gary Whitta. Director Albert Hughes, who generally handles all of the technical aspects to the Hughes brothers films, really had a attentive eye in creating the post apocalyptic landscape. Burgess furthermore, does an exceptional job capturing the particular look the Hughes brothers were gunning for. In retrospect, if as much attention had been paid to the storyline and backstory as the look and feel of "The Book of Eli," the action drama could have very well had a plot that doesn't seem to crumble upon reflection. The action within "The Book of Eli" is ridiculously good, however I expected a lot more action than what is displayed in the 118 minute film. The moments where action is housed, are incredibly striking. Denzel Washington does a remarkable job in every one of his close combat fighting sequences. Washington also comes across as a complete badass, he doesn't toy around with anyone. A lot of the action can also be equally attributed back to the cinematography, which captures the action in such a way that the viewer is fully submersed in the heat of every battle as they play out. A perfect example of the gripping action and cinematography comes in a stand off scene between Eli (Denzel Washington), Solara (Mila Kunis) who are bunkered down in a well armed house, while Carnegie (Gary Oldman), Redridge (Ray Stevenson) and the rest of his men try to flush them out. The entire sequence is nearly one shot, and the Hughes brothers and cinematographer Don Burgess do a stellar job of keeping the viewer in the midst of all the gunplay. Furthermore the opening action sequence between Eli and a gang of cannibals really set the bar high in the tone of combat one could expect to play out in the rest of the film. Unfortunately though, the action comes in spurts and ends up feeling very patchy, ultimately leaving the viewer wanting more. Denzel Washington comes across polished as Eli. His determined and weathered persona is verified in Washington's resounding portrayal. Washington commands attention from the get go and despite a few pitfalls in his scripted character development, the performance is, as always staggering. When the Hughes brothers approached Denzel Washington for the film, he made one stipulation, Gary Oldman had to be Carnegie. Luckily, Washington made this request because, Oldman does not disappoint in his portrayal. Having a character name like Carnegie, I would only expect a brash individual who is staking claim in whatever he can and Oldman pulls off the illustration without a hitch. The supporting cast in "The Book of Eli" does an able job including a few surprise treats like Tom Waits playing the Engineer and Ray Stevenson playing Redridge, Carnegie's right hand man. The exception in the supporting cast however is Mila Kunis. She completely shows her lack of skill when compared to the likes of Oldman and Washington. She is a distraction on screen and seemed like a very poor casting decision for the character she is scripted as. Her performance can be summed up to her trying to keep up with the rest of the acclaimed cast. 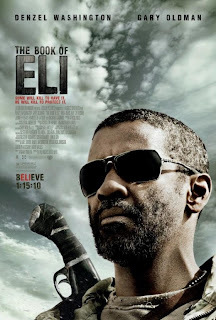 Overall "The Book of Eli" deserves a theatrical viewing. The Hughes brothers delivered an engaging apocalyptic drama that has some spectacular action and stirring cinematography. The story itself houses an arresting theme that gives the viewer enough to engage them, however it is the end result that may come across pedestrian.